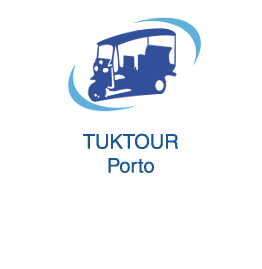 TUKTOUR PORTO offers you the discovery of the cities of Porto, Matosinhos and Vila Nova de Gaia, a playful adventure as tourist sightseeing or guided tours, personalized and environmentally friendly. 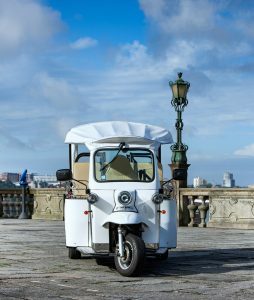 The vehicles, are our “Tuks” – the name used in Thailand – 100% electric, adapted to European safety and comfort requirements. 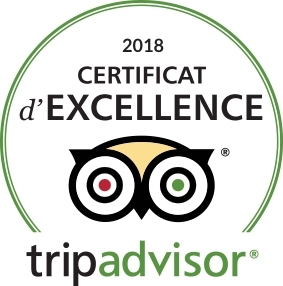 TUKTOUR PORTO can put at your service, up to 8 vehicles capable of carrying a total of 70 people, and invites you to share his passion for this country and its cities and visit them in a different way with our electric vehicles , quiet, comfortable and environmentally friendly. Let yourself be seduced by the charm and enthusiasm that our vehicles cause when passing, the kindness and professionalism of our multilingual guides in your unforgettable tourist sightseeing among family, friends, or romance. Share our emotions, our tours and precious small moments of happiness. Porto Douro – right bank Discover the right bank of the Douro to the sea! Its colorful houses, fishing, castles, Sea Life, Matosinhos and fish restaurants, beaches and seaside walks. Possibility of splitting or partitioning the turn as you wish. Porto – Monastery and Cellars We will join the Serra do Pilar Monastery, to see without a doubt the most beautiful view of the cities of Porto and Vila Nova de Gaia from the river Douro. We'll then descend for a cellar tour with a free tasting of the best Port wines. Porto Baroque With our guides, discover the city "invicta" (invincible). Through the narrow streets, they will tell you the history of Porto, anecdotes, cultural life and his "tips". Porto By Night Offer yourself an unique night under the city lights, on board of our Tuktuks. Yacht tour Ride alongside the River Douro on tuk until the authentic fishermen village São Pedro de Afurada, then embark at the marina for a wonderful private 3 hours ride on the Douro. Porto Exclusive By Night Starting from your hotel, we will take you to a private tasting of Port wines. Following a surprise gourmet dinner and an unforgettable ride under the city lights.